The environmental hazards in the conflict in Ukraine should be a reminder of the importance of strengthening the protection of the environment during conflict. Since the outbreak of the conflict in 2014 between the Ukrainian army and Russia-backed separatists, the so-called “Donetsk People’s Republic,” the heavy industrialised Donbas region has faced an increased risk of ecological disaster. 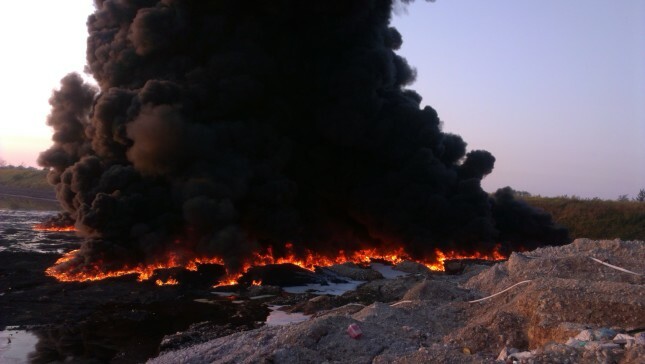 Shelling by both factions could release substantial pollution from the area’s many chemical factories, water treatment facilities, power stations, and others environmentally sensitive sites. One barrage of misfired artillery shells could set in motion a chain reaction that would render large parts of the region uninhabitable, spilling toxic waste into rivers and groundwater, making living there impossible. For five days, we plow our way through the snowy landscape in a rusty, Soviet-era Lada, trying to understand how local villagers, factory owners, and the military perceive these threats. Do they know what could happen if one of the shells hit the wrong target? And how do they deal with the multitude of risks to their health?